WRAP IT UP: Completely cover the compact with the plastic wrap and make sure it adheres tightly to contain everything. MASH IT UP: With your spatula, crush up the entire pan of shadow, not just the broken pieces. You essentially are turning the pressed powder back into loose powder. ADD ALCOHOL: Remove the wrap and add at least 10 droppers full of alcohol. You can add a few droppers full at a time to see how much you need. I used a dozen. SMOOTH IT OVER: Now you’ll feel the powder has become sponge-like and very pliable, giving you the perfect opportunity to even it out smoothly with your spatula. PERFECT THE EDGES: Use your eyeliner brush to smooth it out even further. Give it a few hours to completely dry and it’s like it never happened! To make it extra pretty, clean up the perimeter with a Q-tip. 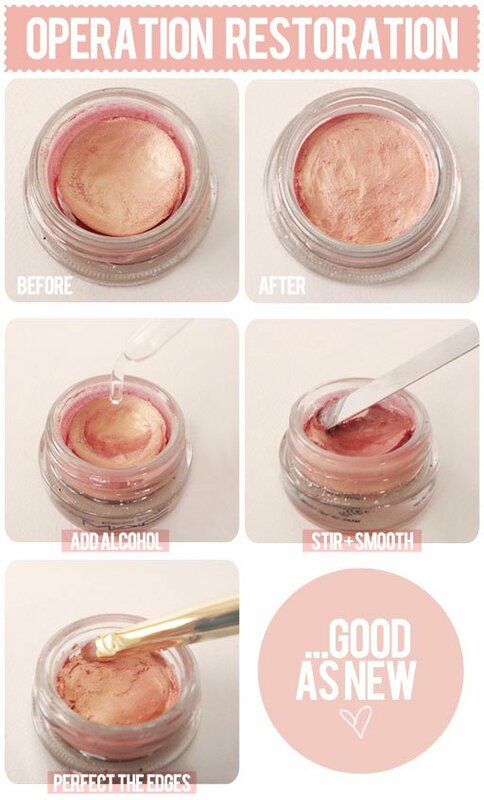 To revive your dried-out and cracked old cream shadow, apply the same steps except there’s no need to wrap it up or mash it up. Just add alcohol to reactivate it, stir it, smooth it out and perfect the edges. If you’re like us, you hate waste and these are two great ways to save and use what you have!